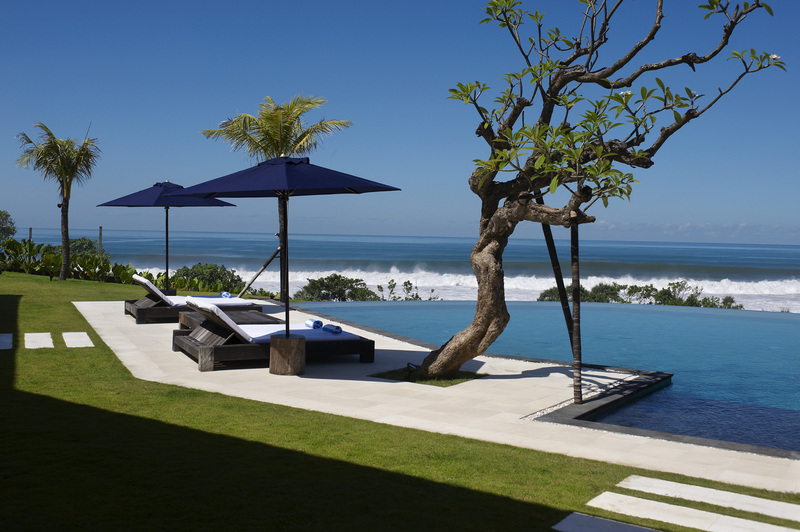 This impressive property rests on a headland beside a deserted beach on Bali’s West Coast. The two-storey building is characterized by white stone walls, cream terrazzo tiled floors and lime-washed timbers. Manicured gardens are on all sides of the villa. Open living with fabulous rice field and ocean views. Absolute beachfront on Bali's west coast. Spacious and well-appointed bedrooms make the most of wonderful views. Resting on a headland beside a deserted beach in Beraban on Bali’s West Coast, this freehold villa sits on more than 21,000-square metres of land and boasts superb 360-degree views of mountains, rice-fields and the Indian Ocean. The ground floor houses an open-air living room, a dining room with glass doors, an air-conditioned lounge, which doubles as a media or games room and comes complete with a pool table. Three bedrooms are upstairs, all have ensuite bathrooms and magnificent ocean view. More bedrooms are in a single-storey guest wing, which is linked to the main building and have views of mountains and rice fields. Gardens are on all sides of the villa where the front garden is dominated by the 27 x 11-metre swimming pool and a helipad rests to one side. Erika Benyamin told WILLIAMS MEDIA "this is a one-of-a-kind sanctuary in a spectacular location." The property is being offered fully furnished and with a freehold title. For more information including additional photos and price information visit the Exotiq Property Bali website. To arrange a private inspection or to enquire about the property, phone or email Erika Benyamin from Exotiq Property Bali.